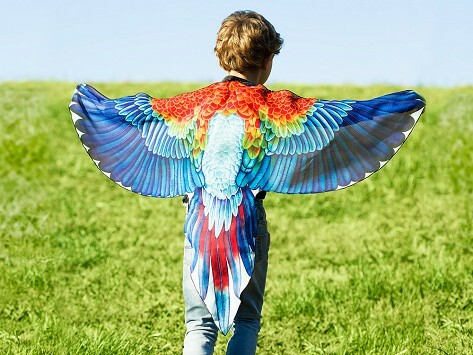 These kids’ bird wings give little ones the (make believe) feeling of the real thing. The lightweight wings are a colorful addition to dress-up or can make for an easy Halloween costume—no feathers required. Realistic details give these lightweight wings a lifelike feel and elastic shoulder and finger loops provide a comfy fit. Dimensions: 52" x 24" x 0.1"
Bought for child if 7. She was impressed that she could be a bird. Colors were exceptional. She ditched her Christmas attire for the wings and wore them all day! My grandson loved this. I gave him two so his friend could play with him. He wore it to the butterfly house. My three year old grandson loves his wings. Light weight, pretty screen print.